Dishwashers are amazing time savers. There's nothing quite like clearing a huge pile of dishes after friends come to visit and having a machine do the cleaning for you while you go back to watching TV. It's also nice to know it's more energy efficient than washing by hand if you fully load it first. However, there are a few amazing things you can put in your dishwasher that you've probably never considered. Toothbrushes and electric toothbrush heads get pretty dirty over their lifetime. Even if you do change them at the recommended intervals of three months, that's still a lot of time for bacteria to build up—bacteria which you're putting back into your mouth twice a day. You can easily put these in the dishwasher, however, and they'll come out sparkling clean. If you hoard cleaning cloths and tea towels, or have a mass of grubby, pale fabric items, a soak in a dissolved detergent capsule brings them back to life. You can even pop them in your washing machine on a hot wash alongside one capsule, in place of laundry detergent. The cloths will emerge far whiter than they would using laundry care products, and you needn't use laundry detergent. Again, run one clear wash after using a dishwasher detergent capsule before putting dark colors in your machine. Use the hottest cycle to clean tools such as pliers, screwdrivers and wrenches when they get sticky and greasy. Plastic broom heads, dust pans, vacuum attachments and floor brushes fit in too. Dishwashing your kids' toys will not only clean them, but it will sanitize them too. 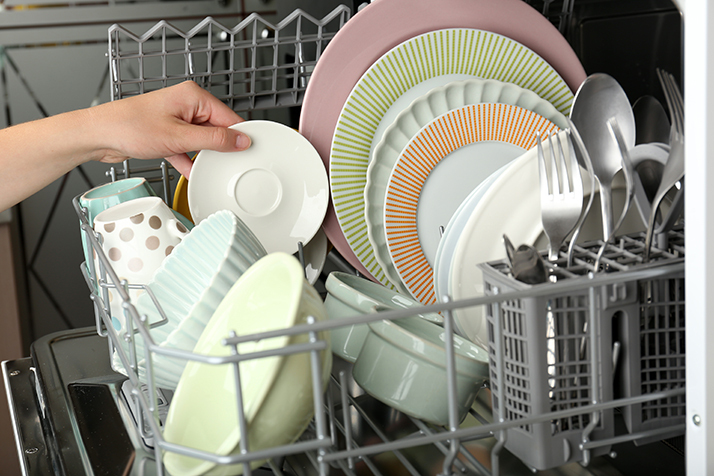 Dishwashers are well known as excellent time savers which make cleaning up after dinner far easier than washing by hand. However, it will come in handy in the above situations.